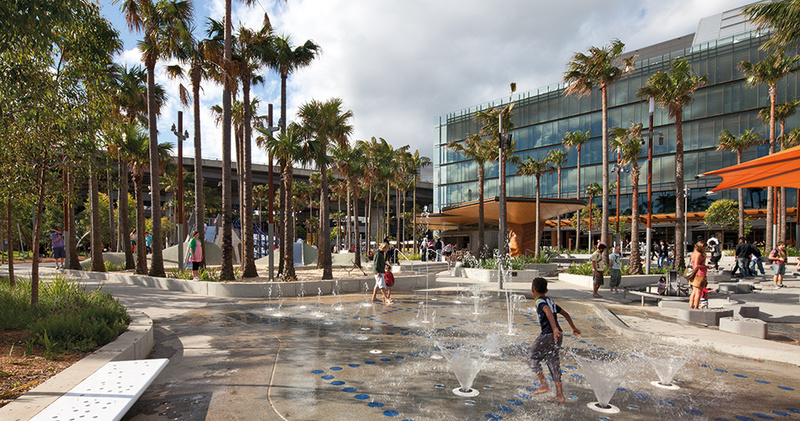 Darling Quarter is a true integration of urban design, architecture, and landscape architecture toward the creation of a public place within the city. We have sought to enhance the joy and beauty of Darling Harbour, one of the most popular public places in Australia, and to do so in a way that imbues it with a sense of quality and permanence. Darling Quarter is where the western edge of the city and the park meet and is celebrated in a series of defined public spaces, including a pedestrian boulevard, parklands, gateway, children’s playground, and activated edges lined with cafés and restaurants. It is a place for everyone, for city workers at lunchtime and in the evenings, families, children, the young and old, visitors and locals. This is a very different type of office building in a very special location. It is an architecture of human scale, natural materials and of a warmth of character appropriate to this very public parkland location. 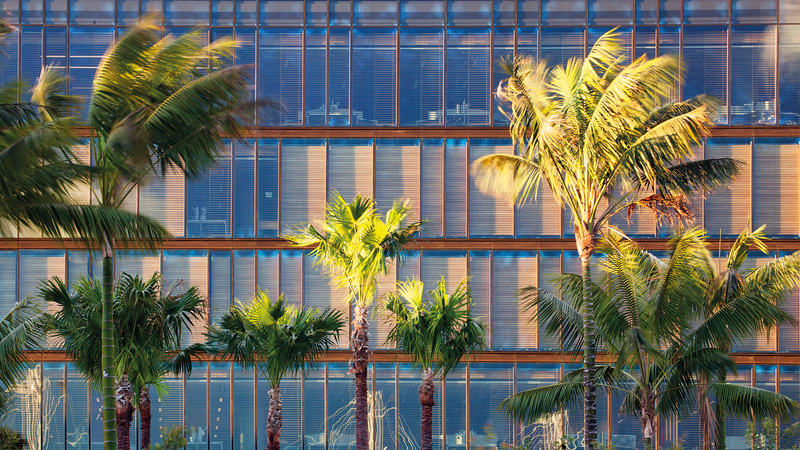 The long gently curving façade defines and enhances the public realm with a warmth and transparency unusual in commercial buildings. The mullions are made of natural timber and irregularly spaced like rows of trees in a forest. Between these deep, profiled posts are adjustable timber louvres that control heat and glare, automatically adjusted in relation to the position of the sun. Importantly, this composed use of natural timber in layers behind very transparent glazing also creates a soft and warmth backdrop to the tree canopies of the parkland. 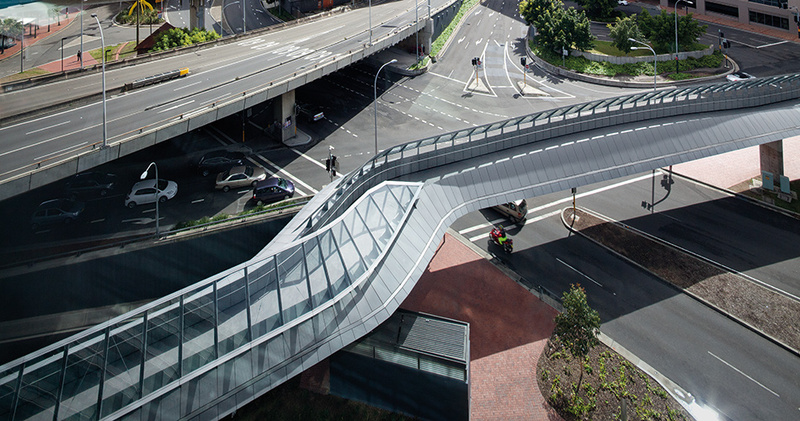 The curves of Tumbalong Park and a ribbon-like connection with the Darling Harbour waterfront determined the primary geometry of the architectural form. Split at its centre, the new buildings frame and define a new pedestrian street, the civic connector, that links south Darling Harbour via Bathurst Street to Town Hall and the very centre of the city. The different scales of the east and west wings of the project respond to and reflect the varying scale of the park and city, united and resolved through the curved roof that draws natural light to the interior. 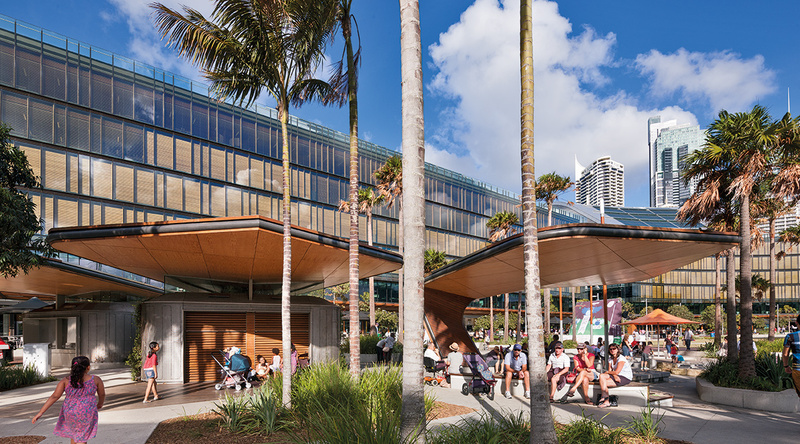 These long forms of timber and glass, capped by the gentle curves and the scalloped apertures of the roof, create a background to the parkland and a foreground to the rising city beyond, uniting the two in a new public place, Darling Quarter. Above the restaurants, cafés, bars and promenade are the work environments of the building, centred around day-lit atriums. 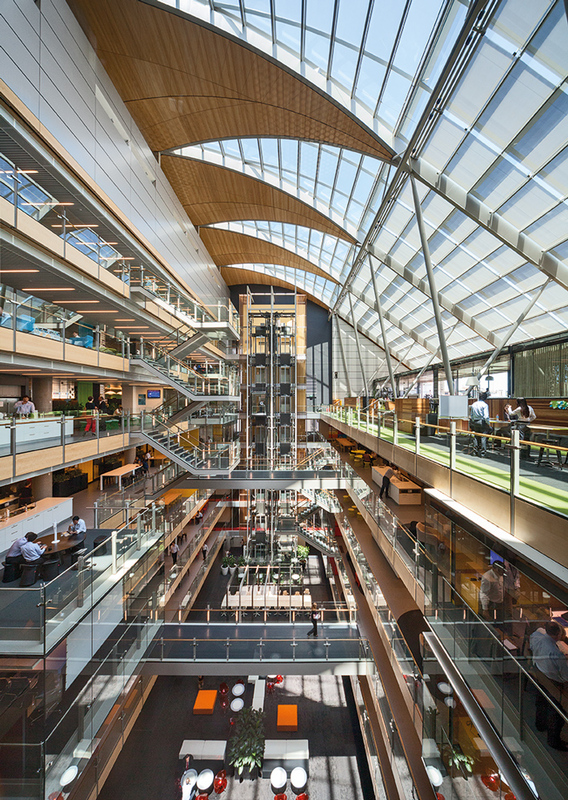 Lobbies on Harbour Street and escalators bring visitors and workers to the dramatic atrium floors. 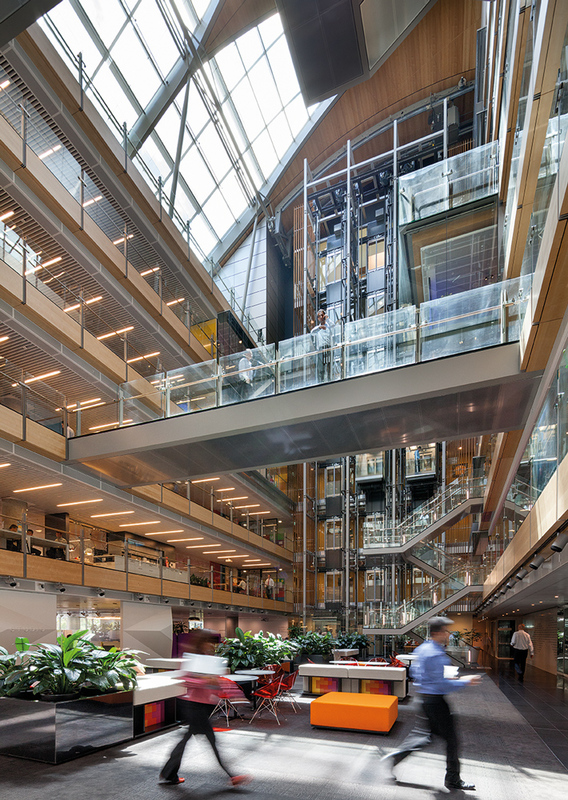 The asymmetry of the workplace floors and atriums, edged with stairs, bridges, breakout areas and glazed lifts, creates a stimulating and collaborative campus environment.  An important aspect of the project’s design innovation and sustainability is not simply the “green” score that reaches the highest levels of sustainable accreditation, but the focus on occupant well being and the creation of an enabling, supportive, human and ultimately inspiring place to work, generate, and exchange ideas.